The Tech Works PBC-2-12 is a Push Button Call Cord made of high impact thermoplastic with a 2 buttons each on a 12 foot cord with a common right angle 1/4 inch phone plug. Designed to provide remote push button operation from the NC-PBS-1 Emergency Push Button Station or the PBS generic patient bed station by simply plugging it into the jack. The button is a non-locking normally open contact passive assembly designed for use with Substations listed above. 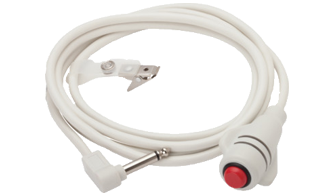 The cord set comes with a security clip and is completely shock and waterproof for use in sterile environments.